New Orleans has been on my travel bucket list for some time now. My dad went to Tulane for college and has raved about everything from the French Quarter to his favorite college bars. I couldn't wait to go but had no impending plans to take the trip. When my dad's golf trip in Tahoe got canceled he offered a quick 48-hr trip to this cajun escape, how could I say no? 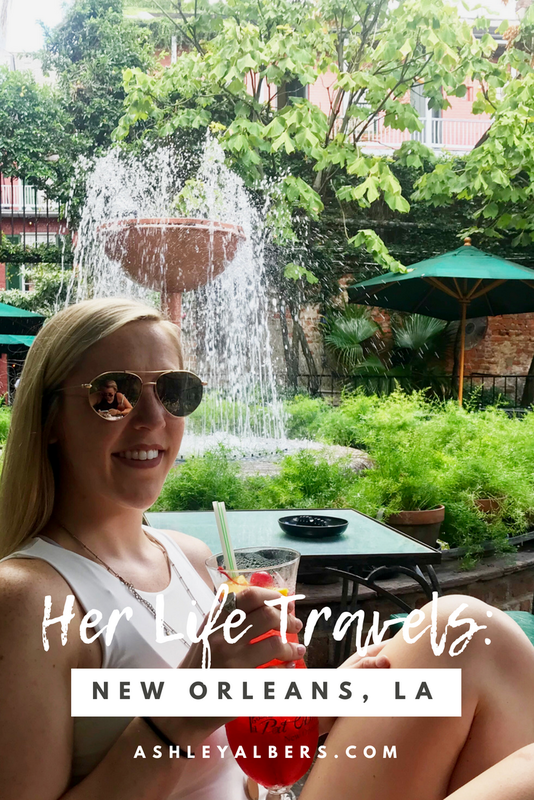 Since New Orleans is a huge tourist stop for Mardi Gras and the experience of this amazing town I wanted to share my favorite places and things from Nola. *I linked to the places so you can check them out! I’m sure it’s just like every other place but it’s the first official casino I’ve ever gone to. First off, the trip was my sister, dad and me and my dad is the only one who’s ever gambled before. You could say my sister and I were nervous. We walking in after only being in New Orleans for a few hours, we step up to the roulette table, and there’s no turning back now. Dad places his chips on all of our birthdays and just like that the wheel begins to spin. And spin. And Spin. Then before you know it, it’s bouncing its way to land on 28, my sisters birthday. We’re feeling pretty lucky so, dad bets again this time on all of our lucky numbers. The wheel begins to spin again and by some luck lands on number 8. My lucky number. With all the confidence in the world we cash out and head to dinner. After a great first go at the casino we go back and try our lucky at black jack. Let’s just say it worked out for some of us but not all of us. My dad and I decided to try our luck once more the last night and of course we can’t get lucky three times so the dealers swept the table all night and we called it quits. However, winning two out of three visits to the casino is pretty good for our first try. One word, beignets. That’s pretty much all I need to say about this iconic place. It was everything we expected and more, to make it even sweeter we were able to help out someone in need while we were there too. Seriously, if you don’t stop in once while you’re in New Orleans you’re doing it wrong. My dad and I have our travel plans down to a science. We schedule our days around restaurants and then take our own walking tour of the city with dad as the guide. Well, of course we need a halfway break for an iconic New Orleans cocktail, right? Insert Hurricane here. Dad insisted I try and how can I say no. We stopped in and walked straight back to the courtyard which left me with no words. This courtyard is so cute and was the perfect escape from the hot summer sun. The best part wasn’t even the drink and courtyard, my sister and I got to hear the story of when my dad decided to go to Tulane. Guess what? He and my grandpa made the decision sitting at the table next to us in the Pat O’brien’s courtyard almost 36 years ago. All I can say is, go to Pat O’brien’s, order a hurricane and enjoy the New Orleans environment. I said we plan our trips around restaurants remember? So of course there had to be a restaurant or two on here. K-Pauls is seriously a must. My parents stumbled into it a few odd years back and it is still to this day one of my dad’s top five meals he’s ever had. Anyone who knows Greg knows that means A LOT. I can’t say anything besides incredible. Below are my super inartistic photos of the food because it was just that good. Lastly, one of the coolest experiences of the whole trip was getting to take the street car throughout the city. The morning we were leaving we decided to take a 45-minute ride down to one of his favorite college spots. It gave us the chance to see all the culture, architecture and hear the stories of New Orleans. It may take longer than an Uber but it’s so worth it. Thanks dad for sharing your home away from home with us.